A spiritual development program for the New Millennium. It is with much excitement and delight that I am able to offer this profound new work, supporting humanity’s Ascension. It is a contract I am fulfilling for the Galactic Federation, the Great White Brotherhood and Sisterhood of Light and Thoth. 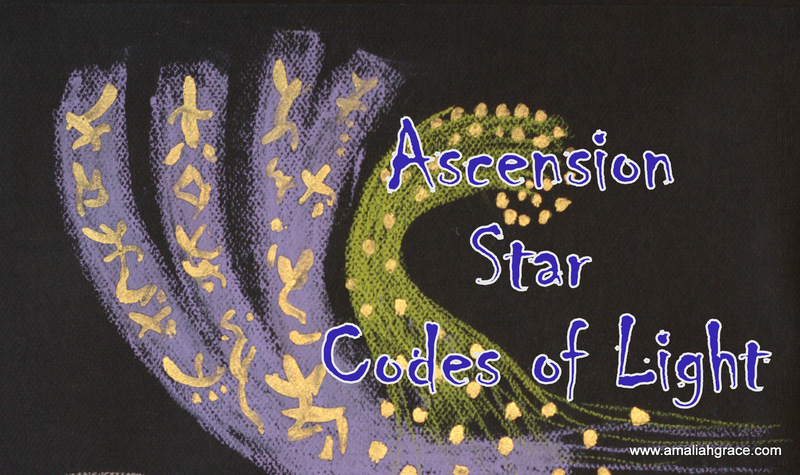 This nine Ascension Star Codes of Light program is available to start. It is broken up into three sections with three codes in each series. Series A, B and C. They are consecutive and designed to take a short rest prior to starting the following series. I value the support of my mailing list who have downloaded and enjoyed the Goddess Sound Streams. I channeled these in to assist the integration of the new energies flowing onto the planet and to assist you to balance them within your physical body. If you would like to receive them sign onto my mailing list. The online course in conducted at SOUL ACADEMY. Once payment is received you will be sent login details to my Academy. An email will be sent to you with information on the Academy. Log in and begin your journey with the first code. Each week you will be sent the next email when the next code is available for you to download. You can also see and listen to the Code in the Academy if you desire to stay logged in. The Ascension Star Codes of Light Series A runs for six weeks. Each sound code and Art code will be sent to you a week apart. You will receive emails each week guiding you through the program and with the files to download. WHO ARE THE ASCENSION STAR CODES FOR? The Ascension Star Codes are for healers, light workers and all who are consciously preparing to elevate their consciousness towards Ascension. They are for people who have developed self awareness, and are consciously working on their inner selves towards becoming their highest Light Being, Light Body or Divine light. Creates a deeper, fuller connection to the call and wisdom of the Soul. Creates focus, intention and clarity for new roles for the New Earth. Assists self empowerment through an expansion of self. Upgrades your physical body to hold higher frequencies of light. Enhances the potential to develop unique spiritual talents and intuition. Helps to unlock and clarify new missions. Triggers dormant DNA to the next best level of yourself. Opens neural pathways in the brain and create positive change to brain chemistry. Assists a deeper profound connection of the Soul to the Cosmos and Mother Earth. Potential to create a life of harmony and balance walking in the light. WHAT ARE THE ASCENSION STAR CODES of Light. The Ascension Star Codes of light, sound and art codes hold the “Frequencies of the New Millennium.”The visual artwork image is encoded with light, color and specific tones which contain packets of light and information within the light language writing and glyphs. They trigger the dormant codes held within the DNA to be released into our cells creating potential for a higher vibration of light to be embodied within the physical form. Each Glyph and sound code holds a unique tone, essence and vibration waiting to assist the awakening of the individual to a higher consciousness. The ability to sit quietly to view or meditate between 15 minutes to 1 hour daily. Most effective if done several times in the day. The ability to listen and meditate with the sound codes. Use of headphones is essential. To have a reasonable understanding of your way around a computer to enable you to download and copy files. Days 1-5 Work intensely with the sound and visual art codes of light. Day 6 & 7 Integration time to balance the changes your work with the codes. This time gives you the chance to see any changes created in your gifts of if you are responding differently to others around you. Do not listen to the sound codes when driving or operating any machinery. These codes have the ability to take you into an altered space. Please use your discretion when you meditate with them especially if you are working full time at a normal job. Online visual art code image which is copyright protected with a watermark not for printing. A download link of a print quality PDF of the visual art code. A Podcast to click & listen whilst viewing the visual code online together. A link to download the Mp3 sound code onto your computer. Mp3 media files can be played on any media player on your computer. Entry to the Ascension Star Codes Soul Family on a Forum. Here you can communicate with others and share experiences. Communication and support with Amaliah Grace via the Forum or email. In the process of change, we need to let go of some old ways of being to create the space for the new to emerge. This is not always comfortable. When we bring in more light, it illuminates what has been previously hidden and asks to be released. Aspects of our previous self, shadow self of the current life or past life/parallel realities.These codes may bring some of these aspects to the surface, however you will move through them very quickly. Each person is unique and on a journey only they and their guides know. What I can say about this program is, it will assist the next step on this journey. It is up to the individual to do “The Work.” If you are focused and disciplined and do the suggested daily meditations, a higher vibration of light is assured. A mature soul is spiritually disciplined. Dedication, discipline and pure intent lead to Mastery. The greatest potential can occur if you step forward into this work with an open mind and heart, without expectations of a specific outcome. This creates an open space within you for the new to unfold and the potential for a magical adventure. However, with any esoteric program, it is impossible for me to give any guarantees. There is no way to prove how much application the individual has achieved. Therefore I am unable to offer a money back guarantee. In essence, I encourage you to surrender to the potential of the Ascension Star codes of light, unraveling the old to embody the new. Ana – France “The Star Codes assist me in being connected to the Universe in all areas and ways. They trigger me to remember the Sacred Writing of the Language of Light and I have began again to write them also. The Sound Codes are helping me with my connection, coming from the deepest part of my Soul. When I worked with Code two it took a little time but then I sense something different. I related to it as the I AM presence, grounding information from the Divine, through the Higher Self down into the Earth Star Chakra, and it’s through the communication with the Star Language which is effective. Janet – England “I am really enjoying the codes, I feel that they are reaching far down into my soul and bringing out a greater sense of being from within. As I meditate I feel that I should respond to your toning and also respond to you in Light Language which tells me that this is a connection from another time and another place. Very empowering. The first code brought up a feeling of loneliness and I felt myself longing to be back ‘home’ which I felt was on another planet in another dimension. It also brought out of me a lot of fear, which I put down to having this feeling of being ‘homesick’ and away from my planetary space. In the meditations it has brought about a certain degree of healing for this strange feeling of loneliness, it has helped me in a very nurturing way to come to terms with the reasons why I keep on feeling this way. Since working through the codes I have certainly felt more empowered. Helju – England “It is wonderful to know that I am able to participate and experience the Code in such a magical way. Code one – Beautiful! I was standing on a shore, the waves gently lapping against the cliffs, lined with several crystal caves. I felt myself enter the water and I became taken by the arms and escorted by two mermaids, and a little reluctantly, taken down ever deeper beneath the sea.